Inspired by The Four Horsemen, an avant-garde poetry group that was active in Toronto from 1978 to 1988, this show is a tribute to their work and an extension of it. It’s about the power of poetry, its visceral quality, and the way it sounds and feels in your body. As the group recited poems and said words so many times that they became abstract sounds, it became apparent that the sounds we make have no inherent meaning, but can still make us feel something. 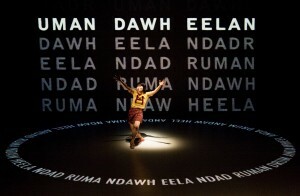 For example, Naoko Murakoshi began the show by saying “A drum and a wheel” in many different tones, speeds, and pitches, and then rearranged the letters to rotate through the whole phrase saying “d ruma nda w heela, r uman daw h eelad,” and so on as the words swirled around her on the stage and behind her on the screen. There were solo recitations of poetry that seemed to have an orgasmic effect on the performer, and group recitations that turned spoken word into music. The way this group brought poetry to life is unlike anything I’ve ever seen.